Elegant Engagements Wedding and Event Planners: Illumination! 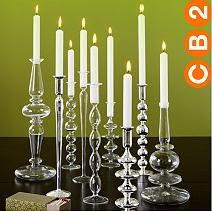 CB2 has these great clear taper candle holders. Perfect for your mantle, sideboard table, holiday table, wedding ceremony, reception tables, birthday or cocktail party. Imagine creating an alter of candles for your ceremony or creating a unique element to your cocktail hour. Between $4 and $13 you can afford to add that little extra. I think CB2 has a lot of unique items to spruce up your next event - check them out. Love these! I purchased enough for every table at our reception.